Historic Preservation Archives - Skillman Family Association Inc.
My father died in 1969 when he was but 57 years of age. Although he had suffered three earlier heart attacks, his death was still, at least to me, unexpected. I was thirty at that time and had been working on my family genealogy for two years. I had asked my father questions about his family, only to discover that he knew little about his ancestors, and I soon learned that my mother was the family historian. So I continued to research my ancestors and asked questions of my mother until she died in 1996, 27 years after my dad. But in all the years I knew my parents, I never asked the important questions. I now know the names of my ancestors, and their dates and places of birth, marriage, and death. I know the whos, the wheres, and the whens, but I don’t know the whys and the hows, particularly about my own parents. Over the years since my mother’s death, I have come to realize that I actually know very little about their lives. For example, my father’s father was a dentist and my father was graduated from our town’s most prestigious prep school, but he never went to college. Why? I was an only child. Why? How did my parents meet? These and other questions have haunted me since my parents died, along with a more basic question: why did I never ask? Not wanting my children, grandchildren, and later descendants to wonder the same things about me, several years ago I began to write my autobiography. My inspiration came in spurts and much of it was written in the dead quiet of sleepless nights. I edited it numerous times and rewrote many sections more than once. I have no idea of how many hours I put into the project, but I labored on it for several years. I backed it up continuously and my autobiography survived crashes of my hard drive and mother board and two computer replacements. I suppose there are many ways to approach one’s autobiography, but I thought the most logical way was chronologically. I began with my birth and have carried it through to my current age of 73. I gave more time to the earlier years of my life in the belief that character and values are formed when we are young. I combed through all of our old and recent photographs and added them where appropriate. Since I have been struggling for a decade with a serious medical issue, I decided to publish my autobiography while I am still able. That will allow time for my children and older grandchildren to read it and ask whatever questions they may have while I am around to answer them. Whatever happens in my life from now on will obviously not be in my autobiography, but all of the significant events have already taken place. RootsMagic™ markets a software program to guide you through the writing of your autobiography, and I am sure there are many competitors who do the same. And there must be a wealth of information on the internet. My goal here is not to tell you how to write your autobiography, but simply to give you the inspiration to get started. 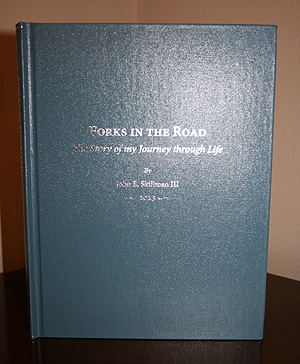 I used Anundsen Publishing Company in Decorah, Iowa, to produce fifteen hardcover books and I am delighted with the result. I found Anundsen in their ads in the National Genealogical Society Quarterly and genealogical publishing is one of their specialties. I must add that it was much nicer to speak directly with the owner, and Erik Anundsen was extremely helpful and responsive. However, any publisher can serve your needs, including Staples, FedEx Office, Office Depot, etc., and numerous self-publishers online, such as Lulu Publishing Services. So I encourage you to begin your autobiography soon. If you are young, you can add to it as you travel through life. If you are my age, waste no time in getting started. You will be surprised at how easy it is because, after all, you know more about the subject matter than anyone else! Most serious genealogists have been using Find A Grave for years. This invaluable online genealogical resource currently lists more than 96 million graves from around the world, including many Skillmans. Each person’s listing is considered a “memorial,” which contains a write-up on the individual, along with the dates and places of birth and death (if known), as well as the cemetery in which he or she is buried. Pictures of the individual and the gravestone are often included, and anyone who feels so compelled can leave virtual “flowers” and a comment about the person. Membership in Find A Grave is free, but you must register in order to be able to add memorials to the website. As of this date, I have added 433 memorials, mostly for my family members and ancestors, as well as a few friends. I have added a memorial for every one of my ancestors if I know where they are buried. I have also added 838 photos of individuals, cemeteries and gravestones, and I have taken 103 photos of gravestones requested by other members for their ancestors. Find A Grave is a website for everyone, and most members are very willing to help out other members. Additionally, I have been contacted by several heretofore unknown cousins who found a common ancestor among the memorials I have created. Another great feature of Find a Grave is that you can link the memorials of people with those of their parents and children, so you can view memorials of an entire family, even if the members are buried in different cemeteries; in essence, you can create “virtual cemeteries.” For example, you can create a single virtual cemetery for all of your second great grandparents, who may be buried in multiple cemeteries, but you can view them all together in one virtual cemetery. If you are not a member of Find A Grave, I encourage you to join and add memorials for your own ancestors as I have. But a word of caution — be sure to read the rules and FAQs before you begin, because there are certain things that you cannot do. It is particularly important that you make sure that no one has already created a memorial that you are trying to enter. Duplicate memorials are a no-no, and there are also special rules for correcting a memorial if you find an error. You cannot make changes to someone else’s memorial, but you can suggest changes to the creator of the memorial and under special circumstances request ownership of an existing memorial. However, you may, at any time, add a photo of the individual or the gravestone. I have also even seen death certificates on Find A Grave. To give you an idea of what a memorial looks like, please check out this link to my father, John E. Skillman, Jr.’s memorial. You will see that you can then click on links to my mother and his parents, his brothers, and then to his grandparents and so on, all the way back to his third great grandparents. These are all Skillmans, and I know you will enjoy adding your own ancestors in this same manner. However, do not be surprised to discover that someone has already added a memorial for some of your own ancestors. Editor’s Note: Should Find A Grave survive the internet age and find itself sustainable in perpetuity, it will provide the invaluable service of preserving legible images of gravestones far beyond their natural lifespan. Among the biggest threats to our historic grave sites are the natural elements which have been escalated all the more by modern industry. Acid Rain has rapidly contributed to the demise of many historic headstones. The gravestones of our ancestors are deteriorating quickly, largely due to acid rain. This is a genealogical tragedy as it makes locating and reading the gravestones of our ancestors continually more difficult. 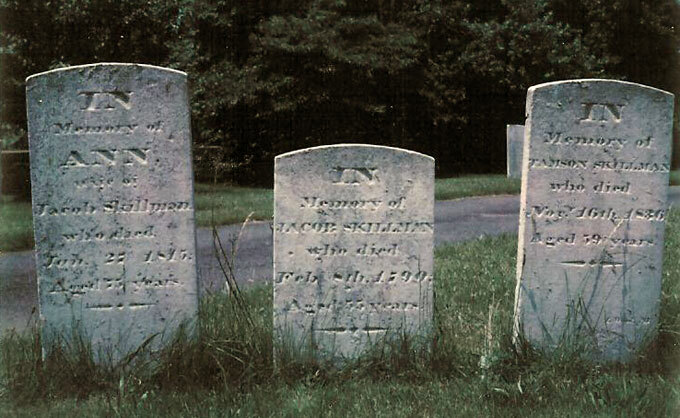 Below you will see two photos I took of the gravestones of Jacob Skillman (born in 1735), his wife Ann (unknown last name) and daughter Tamson. 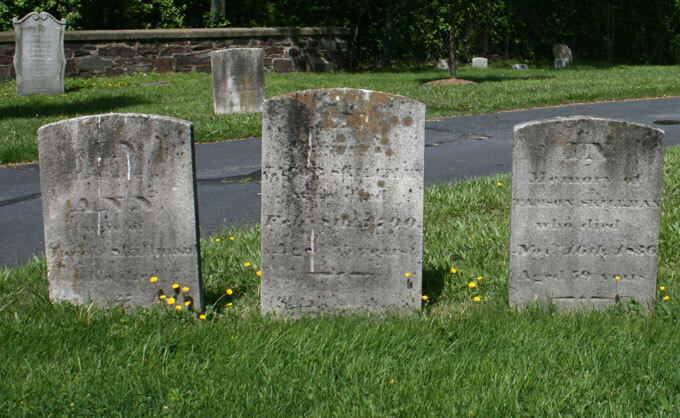 These gravestones are in the Kingston Presbyterian Church Cemetery in Kingston, Somerset County, New Jersey. The earlier photo was taken in 1972 and the later photo in 2007. The difference in legibility between the stones in the two photos in just 35 years is significant. In another 35 years they may be completely illegible. For this reason, I urge all members of the Skillman Family Association who may have photos of their ancestors’ gravestones to join Find A Grave and create perpetual memorials for your ancestors by adding the photos of their gravestones. (For more information on Find A Grave, please see the blog post entitled Find A Grave — An Invaluable Genealogical Resource.) This will preserve their gravestones on the internet for posterity while acid rain does its best to erase their memory. Editor’s Note: The color change between the photographic technologies and reproduction over 35 years is obvious, as is the differnce in groundskeeping. However, the odd situation of the height of the headstones remains. Judging from the dingbat characters (—•—), the center stone (Jacob) has not moved an inch, while the headstones of Ann and Tamson have either sunk dramatically or been purposefully reset lower. It is difficult to imagine that the two outer headstones have sunk uniformly a foot or more over the course of only 35 years while the center stone has remained completely stationary, although the techniques employed at time of burial may be the cause. Without verifiable documentation or a proper archeological dig, we may never know the true circumstances.